Once everyone was happily settled in with crab soup and crab fluffs and crab cakes and crabs, do you think everyone could just relax and eat? Not until everyone at the table had offered to share everything they were eating with everyone else, even if the other person was eating the same thing. 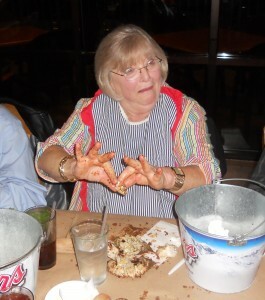 In any kind of decent Jewish family, you have to do this when the food first arrives; somewhere in the middle of the meal, and before you take the last bite of anything. If there are no takers, you can eat the last morsel of food, but you are obligated to feel guilty about it for a full 5 minutes. To enforce this someone will say “are there any more fries?” right as you’re gnawing on the very last one. Most of Baltimore is populated by my mom’s aunts, uncles and cousins. So there are a lot of relatives to discuss, starting of course with the deadest. There was an Aunt Dot who had shoes with clear heels that lit up when she walked. Whole families known solely by their trade, for example, the “Chicken Ehrlichs” whom I suppose raised chickens. Baltimore might as well have been Little Minsk back then for all its eccentric occupants. Apparently two of my distant relatives or friends (hard to say sometimes) stopped speaking in 1958; of course my mom took it upon herself to call one of them to tell her she was absolutely wrong about everything. From the little pieces I heard, the fight was over mink coats; who got one, who didn’t get one, who got one but didn’t deserve it, who couldn’t afford one, etc. It sounded like a lot of animals were harmed in the making of this little family drama. My mom and Bonnye discussed a long gone restaurant that they both believed (insert dramatic music here) was a front for “something.” I think they both watch a little too much television. Then mom and Bonnye started reminiscing about their camp days. I really wish my cousin Myrna had been there so she and my mom could serenade us with old camp songs. We really relish those moments. My mom said that the “talent” she planned to showcase at parents’ day one year was how to upright a capsized canoe and get back in it or something. She was good to go until they were out on the lake and she suddenly realized there were fish in the lake. She did not care to swim with the fishes. At least she pulled it off when they put the canoe in the pool instead. This being October, the conversation across my parents and some of their friends was when everyone was leaving for Florida. There is a superstition that if an old Jewish couple doesn’t leave for Florida by the first frost, their family will be subjected to 20 years of them kvetching about it. I’ve seen it happen. Our server was terrific, but the dessert order was a final test of her patience and perseverance. Before we could order anything they actually had, we had to discuss the Nutty Buddies that traditionally conclude such a meal. Then, because no one was listening, the server had to describe each dessert, in detail, no fewer than 8 times. When the delicious desserts arrived at the table, we had to go through the whole “who wants a bite of this?” ritual again before anyone could pick up their fork and eat their own frackin’ dessert. Big thank you to Chris; when I met him recently at a business function and found out his parents own the restaurant Bo Brooks, I was incredibly impressed. I’m not worthy! Thanks to Chris all of us enjoyed super indulgent desserts on the house. Everyone at the table was very impressed with my high-placed connections, and now they love me-they really really love me. 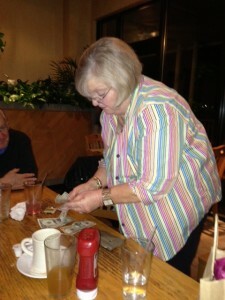 The ceremonial Counting of the Money for the Check is the final ritual. Mom is an expert, but after she counted the money two accountants from Ernst & Young came in to verify the results. They were fine until one of them scarfed down the very last bite of cake. This entry was posted in Uncategorized and tagged Diet, Family, Humor, Irreverent, Judaism, Social. Bookmark the permalink.